CES 2009 – Shows a lot of Mobile Phone and one of those is The new Palm Pre which has curved body with a slide-out vertical QWERTY keyboard and multi-touch screen. 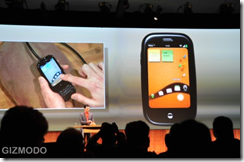 According to those who have seen this in action at CES 2009, It has a slick in appearance and efficient in function, its webOS aims to bring together all of the facets of your life into one seamless application. They are also saying that the Pre looks like it could be a major threat to the iPhone and Android-based G1. Palm has not set an exact availability date or a price for the Pre, but it will be on Sprint’s 3G network. Email: Microsoft Outlook with Microsoft Direct Push Technology POP3/IMAP (Yahoo, Gmail, AOL, etc). So it does push exchange email, but the rest is not push. I hope so, to time it with todays economic crisis. How much will this smartphone will sell when it hit shelves? I didn’t know Palm was still around, I thought they got acquired or something. Hahahaha, You’re right they have been resurrected.